It's Monday which means it's time again for another #ConfidentMeAandE. This series has already had some wonderful contributions from some amazing Guest Bloggers and this week is no different. This week Sarah from Beauty Addict brings us her tips on how she's able to find a Work, Life, Blog balance. It's a method we could also start doing today and I for one will definitely be trying to strike more of a balance this year. I love Blogging – I really love it. I love sitting down at my computer writing posts, taking photos (although I really do need to work on this one), being on Twitter and other Social Media and engaging with other Bloggers, and most of all I love being part of the Blogging Community, and meeting and getting to know other Bloggers. And in an ideal world, I would be doing all this every day. However, the reality is I work full-time, and I am finding the constant struggle of Blogging, working full-time, doing all the necessary household chores etc. and still having a life quite a hard juggling act at the moment. I recently took a step back from everything to sit down and think about how I could make it all work, and for me to keep Blogging, as it is something I love and enjoy. One of the things I decide was to only post twice a week, as I was trying to post 3 times a week, and I was just finding it too much of a struggle to maintain. For me, planning is key. I like to think I am an organised person, so I sit down on a Sunday evening with my Diary/Planner. I work out for the following week what commitments I have in terms of work (busy days, having to stay late etc. ), I then add in evenings where I can hopefully do some Blogging. I try to only schedule things on weekdays as I like to have weekends for me and my man to do things or just relax at home. I have started Slimming World recently, so I like to also schedule in my Planner exercise and gym classes, and I sometimes will schedule in some early morning Blogging – to try and grab 30 minutes of time in the morning before going to work to just hop on my computer. I know it all may sound a bit boring planning everything out, but I like to feel in control of things, and this for me works perfectly. When I am not feeling in control, I start to lack confidence in myself and worry that my Blog posts are awful and no-one will read them. 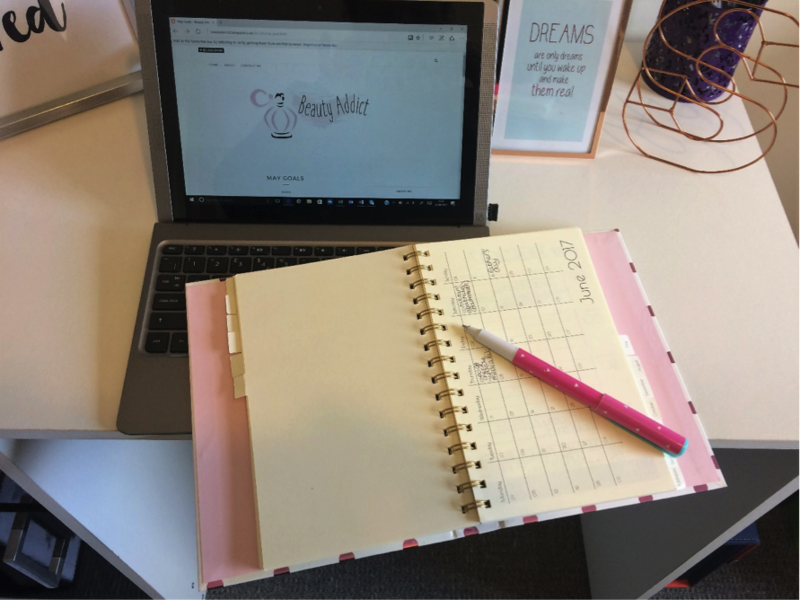 Just a bit of control and organisation helps me to keep on top of everything, and keep myself motivated to continue Blogging and maintain a healthy Work Life balance. It really is all about Balance, and planning has helped me find my balance. For more articles from the #ConfidenceMeAandE series head check out the links below for thoughts on building confidence, self-esteem, and living life to the full with Mental Health struggles. If you like what you see don't forget to share with the hashtag #ConfidentMeAandE, on your social media and tell us in the comments your tips for striking the perfect work/blog balance!